One of the most invaluable tools to have is to understand the climate you live in and how it will affect your gardening and landscaping plans. There are a plethora of plants out there to choose from and many so beautiful that it’s easy to get excited and daydream (it happens) about growing that plant in your yard. The reality check is that not all plants match all climates, no matter how much we might want them to. On the other hand, you might find that you can grow more plant varieties than you thought, and that is always a happy discovery. and Second, the Sunset Climate Zone Map – http://plantfinder.sunset.com/plant-home.jsp. Both of these maps give you zone numbers, that you can then use to pick out plants you want for your garden. The USDA Map is the standard by which gardeners and growers can determine which plants are most likely to thrive at a location. The map is based on the average annual minimum winter temperature, divided into 10-degree F zones. 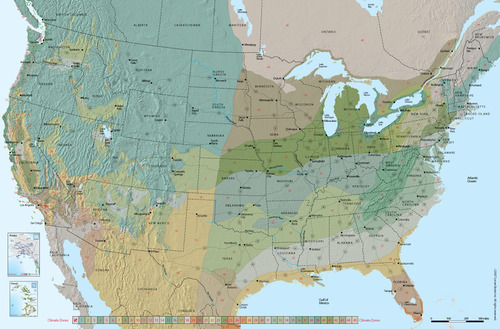 The Sunset Climate Zones Map is different from the USDA Hardiness Map. The USDA maps tell you where a plant may survive the winter; The Sunset climate zone maps let you see where that plant will thrive year-round. 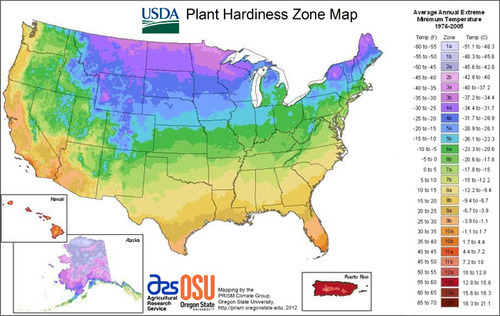 Although the USDA Hardiness Map is helpful, as a gardener, I find the Sunset maps more beneficial because it factors in more variables, such as Latitude, Elevation, Ocean Influence, Continental Air Current, Mountains, Hills and Valleys and Microclimates. So, as we spend January considering the various perennial vegetables that might look good in your yard, knowing your zone numbers will help you decide if that particular plant is right for you, and right for your garden. Ok, now back to perennial vegetables.